Corby Silver Band is a traditional brass band, that was formed for the Pole Fair in 1902, making it one of the oldest bands in the local area. Although the majority of our players come from Corby and Kettering we have players from other surrounding towns and villages in Northamptonshire and beyond. Our players are hard working and committed and this shows in the many indoor and outdoor concerts we perform each year. We also constantly strive to improve our playing ability by participating in contests, currently competing in the 3rd section of the Midlands Area championships. We try to find the correct balance of serious music making, whilst still having fun, making new friends and joining in with social events. For more details about these and any other vacancies we may have, please see our Vacancies page. Our musicians come from a wide range of musical backgrounds with a range of abilities and experience, from the younger members for whom Corby Silver is their first brass band, to players who have many, many years experience playing in a wide variety of musical groups. 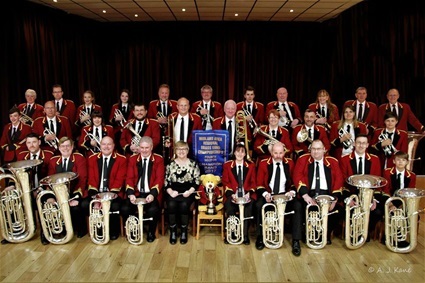 Some of our musicians are members of other local brass bands, so we have a good relationship with lots of other musical ensembles across the local area.